This is Miller. 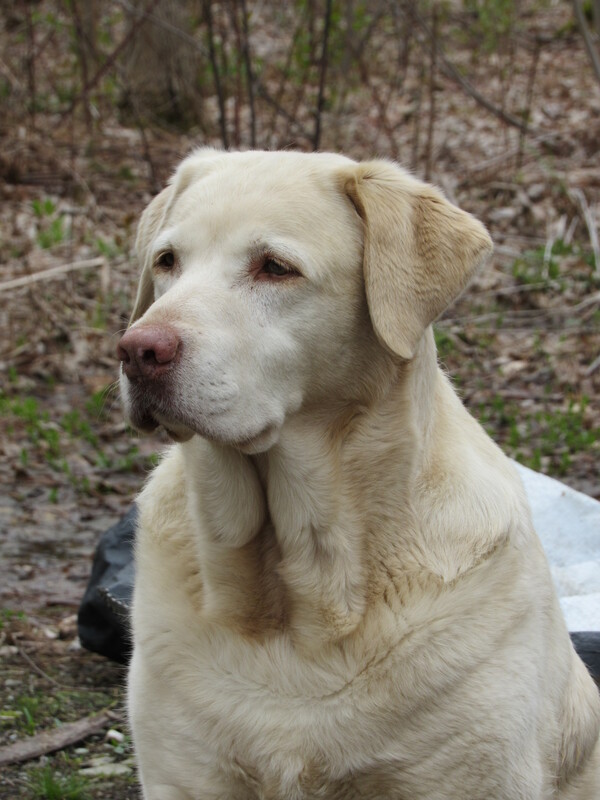 Our big loveable and loyal lab. Miller loves people. He’s our nursery greeter…happy for a pat and a belly scratch. He’ll gladly follow you around as you look over the plants in the nursery rows or as you roam the display beds. When we weed the gardens, he likes to be close, often laying right beside us. When we get up to empty our weed buckets, he’ll follow along. Miller has dedicated himself to being a constant companion. Johnny on the spot. Our very reliable sidekick. This year Miller is showing his age ( he’s 10). He tires more quickly on walks now. He sleeps more soundly than he ever has and he can no longer make the jump into the pick-up by himself. We keep a hay bale nearby so that he can use it as a step up into the truck. He doesn’t mind that his old body can’t leap up into the truck or that he can’t run fast anymore, he’s just always happy to be with us. He has always been our goofy, happy-go-lucky dog. That’s Miller. This year, however, Miller has decided that he feels uncertain about other dogs coming to the nursery. We’re not sure if it’s because he can’t see as well or if being less able has left him feeling a bit vulnerable. We’ve never allowed visitors to let their dogs out at the nursery, even if they have a leash. It’s just not something we’ve ever felt comfortable with. Now, with Miller getting older and feeling less steady on his feet ( and less mentally alert), we thought it might be a good time remind customers about our dog policy. If you are traveling with your pup in the car and you do come to the nursery, please leave them in the car as you shop or walk around. We have a nice very shady parking spot up near the nursery and with the windows rolled down, it should be quite comfortable. If your dog needs water ( we’ll happily get you some!) or needs to get out and relieve themselves, there are plenty of spots to let your dog out just down the road a piece ( away from the nursery). We and good Ol’ Miller really appreciate your understanding and consideration, the nursery is certainly a place we want people to feel welcome, but we’re trying to give Miller a sense of comfort as he enters old age. Thank you and we hope to visit with you this summer! 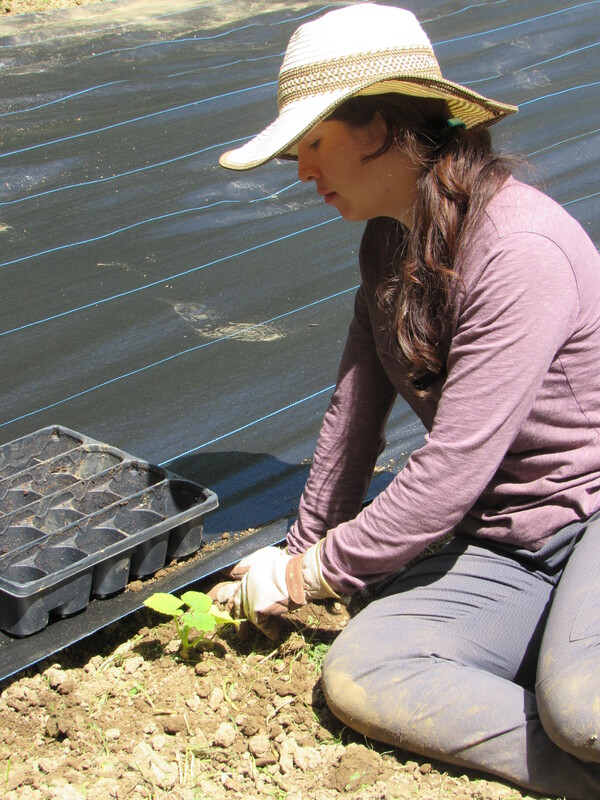 Our latest WWOOF volunteer( What’s WWOOF? Check it out here) enjoys foraging for wild edibles.This week while weeding the iris bed, she brought in the harvested (weeded) dandelion greens and made a yummy pesto. Along with our nightly side of cultivated greens from the garden, we mixed the dandelion pesto into some fresh spinach tortellini. Delish! Dandelion greens are loaded with vitamins (vitamin C, A, B1, B2, B6 and abundant in vitamin k) and minerals ( calcium, iron, magnesium, and potassium). They are a great antioxidant and help to stimulate good kidney and liver function. This was all put into the food processor and blended together. It made two 1 pint jars of pesto, which is already gone! We’ve also been smearing dandelion pesto on our mid-day grilled cheese….sharp cheddar, home-made sourdough, our own bread and butter pickles, and sliced avocado. These we put under the broiler until the cheese is bubbling and gooey. 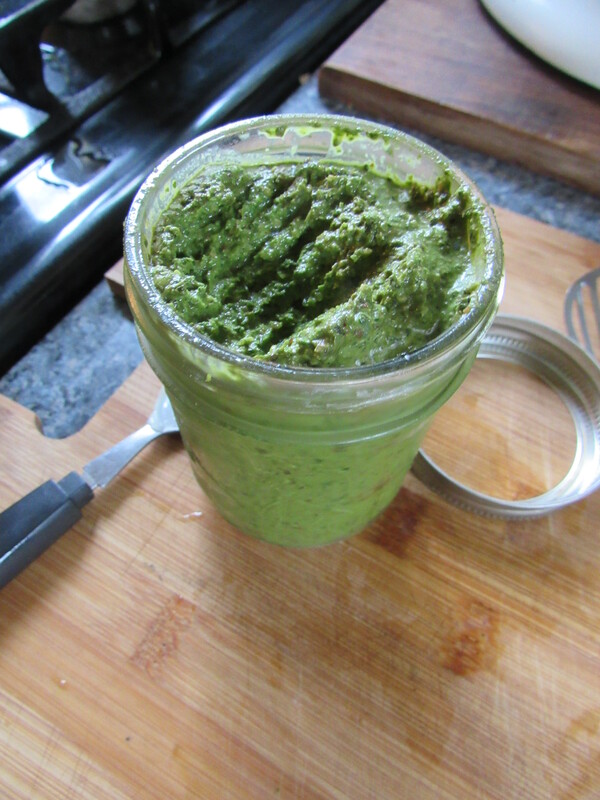 I can only say, I sure hope those dandelion weeds that Lauren eradicated bounce back quickly…we’re out of pesto!! Join us here at Fernwood Nursery for a class on designing and constructing your own hypertufa vessel. Hypertufa is a lightweight medium often used in molding pots, troughs, and planters. Learn the basic ingredients for a hypertufa mix and about the various forms that can be used to create unique and natural looking outdoor planters. Class limit 10 and preregistration required. Please call us at (207) 589-4726 or email us at fernwoodnursery@fairpoint.net. You may also contact us here. My posting activity has been on the slack side of things, apologies everyone! I’ve just returned from a graduation and a quick visit to Virginia. It is a very difficult time to leave home but this was an event I couldn’t miss, so off I went. Rick held down the fort here at the nursery, keeping the world of Fernwood running smoothly. Virginia is beautiful! The flowering magnolias (Magnolia grandiflora), the dogwoods ( Cornus kousa and Cornus florida) and the sweet smelling gardenia were all in bloom and lovely. It is a very tidy state and well mapped out (this being very helpful considering how easily I can navigate myself out of the wilderness but am terrible with finding my way through congested cities). I hardly saw any trash scattered on the roadsides! Virginians should be very proud of this, it makes all the difference when the roadsides and streets are kept tidy! The people of Virginia are very friendly, smiling and saying howdy, never passing you on the street without a smile and a hello. I loved this. The beauty of Virginia was felt everywhere…in its towns, along the beaches, and throughout the rural areas. In addition to having a wonderful time with our son, Noah and his fiancee, I traveled with a dear friend ( a Virginian!) who offered up the very essence of her state….kindness, generosity and a welcoming that beat all. Thank you, thank you, Kari! I’m home now and back in full swing. We’ll be posting any summer classes this week. We’ll be weeding and planting and harvesting. We’ll be greeting a new WWOOF volunteer. 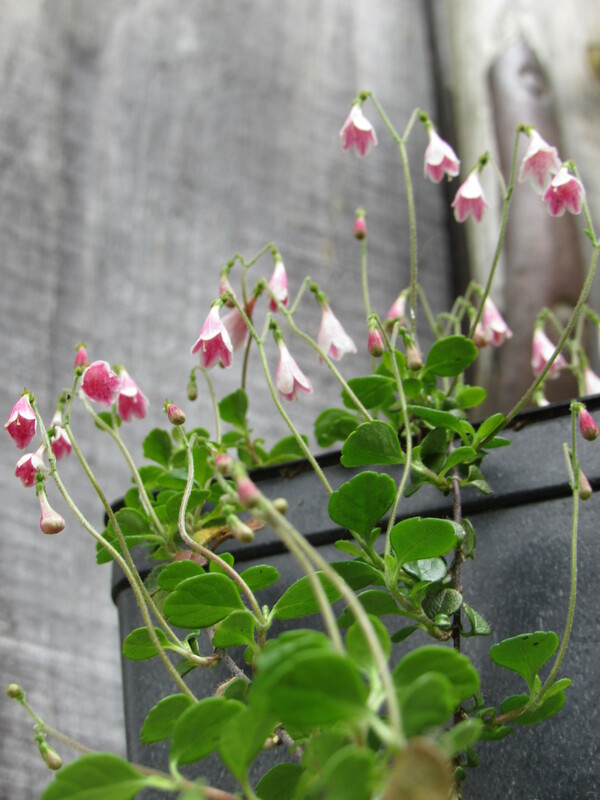 We’ll be continuing to stock the nursery with mid-summer delights. Come on by and say hello, the gardens are bursting and there will be lots to share! Some fine words to be thinking and perhaps to live by….